Plans to expand Lydd airport have been approved by the government following a pubic inquiry. This tiny airport, on Dungeness and close to a nuclear power station, has ambitions to handle half a million passengers per year, and wants an extended runway and a new airport terminal. Shepway District Council gave permission for the expansion in 2010 but the application was called for a public inquiry. Now both Secretaries of State for Communities and Local Government (Pickles) and for Transport (McLoughlin) have approved the development – subject to environmental, noise and traffic conditions. The safety issue of an airport so close to a nuclear facility have not been examined fully or properly at the inquiry. The main opposition group, the Lydd Airport Action Group (LAAG) has fought tenaciously on the nuclear issue for years, and the European Commission has already started infringement proceedings under the pilot mechanism relating to the Nuclear Safety Directive. The government is also liable to legal challenge due to infringements of the EU Habitats Directive. Plans to expand a Kent airport have been given the go-ahead by the government following a pubic inquiry. Lydd Airport bosses want a new terminal building and an extended runway to take up to half a million passengers a year. Opponents said safety fears about the nearby Dungeness nuclear plant had not been addressed. Shepway District Council gave permission for the expansion plans in 2010 but the government called for a public inquiry. The £25m project, also known as London Ashford Airport, includes a runway extension of almost 300m (328yds). Hani Mutlaq, the airport’s executive manager, said the government’s decision was “a victory for common sense and for the people of Romney Marsh”. The approval is subject to environmental, noise and traffic conditions. “Once all these have been addressed, we hope to begin the runway construction work as soon as possible,” added Mr Mutlaq. Andrew Ogden, from the Kent branch of the Campaign to Protect Rural England, said: “The issue of nuclear safety has always been raised. Following the runway and terminal extensions, more than 200 people will be employed, the airport said. Yvette Austin, the BBC South East’s environment correspondent, said: “The decision can still be challenged. “The people who are opposed to the development such as the RSPB and CPRE Protect Kent, could go to the High Court. The Secretaries of State (SOSs) for Communities and Local Government and Transport have approved the development of Lydd Airport. The planning inspector also recommended approval. This is despite the development infringing at least two European Directives: the Habitats Directive and the Nuclear Safety Directive – opening the government to legal challenge. Infringement proceedings under the Pilot Mechanism for the Nuclear Safety Directive are already underway. · Lydd Airport is owned by Sheikh Fahad al-Athel, a Saudi businessman. 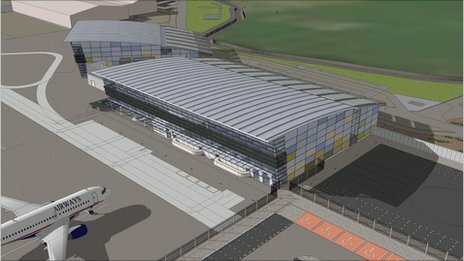 · Lydd Airport submitted a planning application in December 2006 to both extend the runway at Lydd by 444metres and build a new terminal to accommodate up to 500,000 passengers per annum (ppa.). This is Phase 1 of a longer term plan to increases passenger numbers to 2mpppa. · The airport was unlawfully granted planning permission from Shepway District Council on March 3, 2010. Following over 14,000 letters in protest, the Secretary of State called in the decision for review by a Public Inquiry in June 2010. The public inquiry was conducted from February 15th, 2011 to September 16th, 2011. During 2012 four additional consultations took place to review new evidence on nuclear safety. This reinforced the body of evidence produced since 2007 which demonstrated that the nuclear regulator’s decision NOT to oppose LyddAirport’s development was flawed. The Green Party’s MEP for the South East has reacted with dismay after the Government approved the expansion of Lydd airport. “It’s hugely disappointing that the Government has given the green light for this damaging expansion. The large number of people that requested a public inquiry into the expansion of Lydd airport shows that there are huge concerns about the impact these proposals would have in terms of the increase in pollution for local residents and the threat to important wildlife. Dungeness peninsula is one of the most important and sensitive wildlife habitats in the UK. The airport’s expansion will have an impact outside the immediate locality, damaging internationally protected wildlife sites. “Expansion of services will also increase noise and air pollution and raise greenhouse gas emissions in the area. Such developments would set a dangerous precedent for the rest of the region, and indeed the rest of the UK. The expansion also brings with it a serious nuclear safety issue that the government seems to have ignored. Lydd airport currently caters for largely light aircraft, but the planned expansion would see far larger and heavier planes taking off and landing from the airport on a regular basis. If one of these large aeroplanes were to crash into Dungeness nuclear power station the consequences could be devastating. Louise Barton, from Lydd Airport Action Group, said: “Not a shovel will be put in the ground. “This is not going to happen. It’s not needed, not wanted, and considering the nearby nuclear power station, far too dangerous. It would impact one of the most protected environments in the UK. “We will pursue every avenue to ensure it does not happen. Wendy Nevard, of Littlestone, said: “Yet again the views of the ordinary man have been suppressed in favour of the might of deceptive claims about economic gain. Neil Sinden, director of policy and campaigns for the Campaign to Protect Rural England said: “This is a terrible decision which threatens one of the few remaining areas of rural tranquillity in heavily pressured South East, and in a county once proudly described as the Garden of England. “It will not just alarm environmentalists. There were many in the aviation sector who considered this scheme to be nonsensical and a non-starter. Lydd Airport has today been given government approval to expand its runway and build a new terminal. The airport, on Romney Marsh, wants a 960ft runway expansion for passenger jets and a new terminal building for 500,000 passengers a year. Its controversial bid for planning permission was first submitted more than six years ago and faced strong opposition by some residents, environmentalists and the RSPB. A public inquiry ended in September 2011 and it was announced today ministers have agreed with a planning inspector’s recommendation to grant approval for the £25million development. Airport managers are now seeking a meeting with Shepway District Council planners to tackle any concerns about the environment, noise and traffic. It is hoped construction work on the runway will be begin soon after. Damian Collins, who represents Folkestone and Hythe, hailed the approval – which will bring a jobs boost to the area – as “excellent”. He added: “The expansion allows the runway to be lengthened so flights can be operated over a longer distance. But the Campaign to Protect Rural England said the decision will “irreversibly damage the wildlife habitat and beautiful landscape unique to the area”. And the wildlife charity RSPB branded the decision “shocking” and expressed “profound concern” for the future of the area. The airport’s owners have already spent £35million over the past decade in modernising the airport, which has operated on the Dungeness peninsula since 1954 and was once one of the busiest airports in the UK – in 1958 it handled 223,000 passengers, which was 37,000 more than Gatwick. Lydd Airport executive manager Hani Mutlaq said the government’s decision was a “victory for common sense and for the people of Romney Marsh”. He promised his management team would move ahead as quickly as possible the project that will “create jobs, boost tourism and revitalise a long-standing economic blackspot”. Mr Mutlaq, pictured right, said: “We submitted our planning applications in December 2006 and it has been a long road to get to where we are today. The saga over whether or not to develop the airport has dragged on for as long as six years, but Marsh people had anxiously waited for an answer following the end of months of public inquiry in September 2011. Groups such as Lydd Airport Action Group have also opposed the development for fear of environmental damage. Neil Sinden, from the Campaign to Protect Rural England, said the environmental damage outweighs any economic benefits. He said: “This is a terrible decision which threatens one of the few remaining areas of rural tranquillity in heavily pressured south east, and in a county once proudly described as the Garden of England. And it will not just alarm environmentalists. “There were many in the aviation sector who considered this scheme to be nonsensical and a non-starter. If there are any economic benefits, which is　unlikely, they will be heavily outweighed by the environmental damage that it will cause on so many levels. RSPB conservation director Martin Harper said: “This is the wrong decision as it opens the door to real damage to Dungeness, to its wildlife and the quality of life for many of its residents and risks destroying a unique asset that is enjoyed by hundreds of thousands of people. “Dungeness is a special place for nature which is recognised globally for the importance of its wildlife. This decision means nowhere is safe and signals that nature is in trouble in the face of unfettered growth – these are worrying times for all who care for Britain’s wildlife. But Shepway District Council leader Cllr Robert Bliss welcomed the move. He said: “This vindicates the decision we made in March 2010 to approve the expansion plans. We spent several hours debating all the issues and were aware of the environmental concerns expressed by some parties. “However, we were confident that any impacts could be mitigated and that the undeniable benefits to the Marsh economy outweighed any environmental impacts. “As a council we believe that the expansion plans will offer an economic lifeline to the Marsh. The area is losing its power stations at Dungeness and there is no other significant employer waiting in the wings. You do have to think about the risk of an aircraft hijack and terrorism having larger aircraft flying so close to a Nuclear Power Station.It would only be a matter of seconds from a large aircraft straying from its approach/flight path and aiming for Dungeness. There is nothing that would be able to be done in that time to prevent a major incident. Legal challenges will now be forthcoming thick and fast from RASP/CPRE / LAAG/ et al on the nuclear issues/ habitats laws and much else. Just recently the EU put in a spanner re the Gov not taking the Off’ of Nuclear Safety’s views into account. This may well result in a challenge to the EU as well.It also further shows how completely bogus the Gov’s policies on ‘localism’ are. 3 to 1 local people opposed this and very likely still do.There’s very far from any guarantee that the airport will ever succeeed anyway. It’s too remote and lacks connections. The Marsh is the worse blackspot for road accidents in Kent (incl fatal ones). The rail- line is a non starter- needs £2 million to justify a station and 13 road crossings need upgrading – too expensive. Even far better situated Manston struggles- the Schipol service is far from proven. The list is of reasons against Lydd airport expanding is VERY long. Frankly if this airport can get the go ahead where the economic case is so marginal yet the environmental case so strong, where is safe? Dungeness A has been decommissioned and Dungeness B is due to stop generating power by 2018 but the local MP said the community backed a new Dungeness C.
The Lydd application was made, and granted permission, at a time when the 2003 Aviation White Paper was government policy. This policy has now been superseded and instead the UK government published their Aviation Policy Framework in March 2013. 12. The APF was not before the inquiry but, as a statement of Government policy, the Secretaries of State have taken it into account in their determination of these applications. They have also carefully considered whether or not there should be consultation of parties on the implications of this change to the cases they made to the inquiry. The Secretaries of State have decided that further consultation is not necessary. This is because, while they consider there to be a change in emphasis in aspects of policy relevant to these applications, that change is not significant where London Ashford Airport is concerned. In particular, the APF makes no recommendations either in favour of or against development in the case of any of the existing airports in the UK, including with respect to London Ashford Airport. It expresses the Government’s general support for growth in the aviation sector, but is neutral as to the question of where and when such development should take place. March 24, 2013 Observer article by Jamie Doward. Public Inquiry ended on 16th September 2011.